Thanks to all of our supporters, we’re about to cross the $4000 mark. Our fundraising page shows nearly $2000 but all of it will be matched by my employer, MathWorks. All contributions will go to Children’s Hemiplegia and Stroke Association to provide support and information, research and grants to other families like ours. I feel so grateful for the support and encouragement, both financial and emotional. It means a lot to have you reading my streak of posts in the month of May to spread awareness about pediatric stroke. 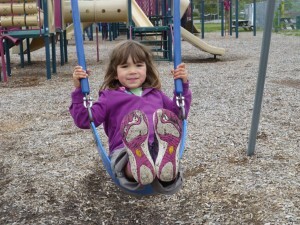 If you look at Mia in this picture of her swinging, there’s no sign of her stroke. If you meet her, you’ll see a happy girl, eager to play, dance, explore, and sing. There’s a paradox in parenting a child with this sort of mild disability. The better their recovery, the more invisible the disability becomes. On the one hand, this is highly desirable, a cure or “near-complete recovery” as one neurologist mentioned as a possible outcome in Mia’s first week after being diagnosed with her stroke. Of course, I want Mia to function as well as she possibly can in the world, so I am thrilled with how well she is doing. On the other hand, the less apparent her special needs are, the harder it is to advocate for her, the harder it is for me to get the kind of support I need to keep at it behind the scenes day-after-day and year-after-year. In this month of daily blogging, I’ve gotten more comfortable with both sides of this paradox. Through sharing more of our story with a wider audience, I am somehow able to celebrate Mia’s successes against a backdrop of her challenges more fully, honestly, and openly. 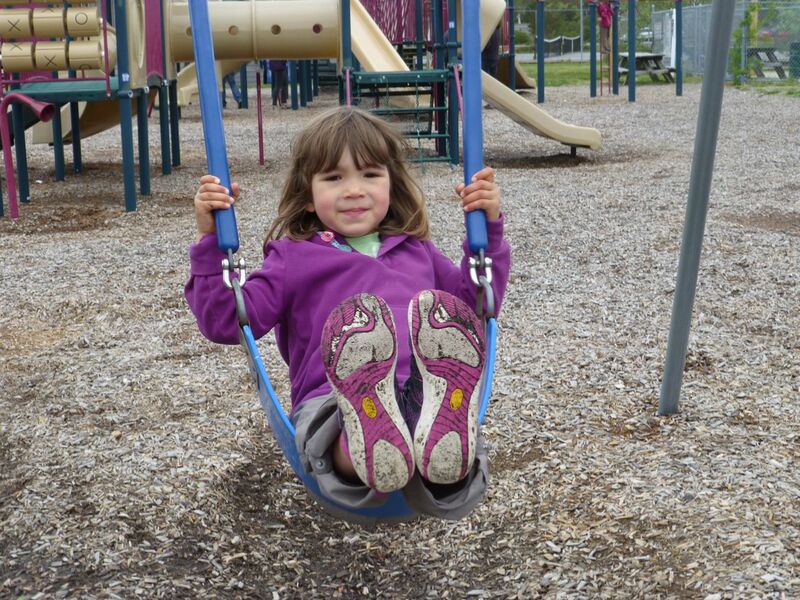 Mia’s triumphs on her bicycle and on the monkey bars are that much sweeter because there were months and years of uncertainty about how much functioning she’d gain. I’ve found myself walking this line repeatedly, grappling with how to optimally support her development and recovery while simultaneously accepting her just as she is right now. I’m convinced that both views matter to Mia, to Zoe, to me, and to others in our lives. I’m convinced that my combined celebration, vigilance and advocacy for Mia over time have made her near-complete recovery possible. As I write this, I am trying to choose just one picture or video to show the then-and-now of it. Here’s what I found. Mia started crawling in a dingy motel room in Western Massachusetts, where the girls and I spent one night to wait out a blizzard that hit right after Valentine’s Day 2010. We were driving back home from Ithaca to Massachusetts after an emergency goodbye visit to see my mother who had suddenly stopped talking and was in her final weeks of life. Mia was almost eight months old. Zoe had recently turned three. Mia’s crawling in her own way. Zoe is cheering her on and trying to help. I am observing, capturing the moment, and protecting Mia’s ability and right to move independently. This entry was posted in Pediatric Stroke Awareness Month 2013 and tagged crawling, independence, invisible, Mara, Mia, stroke, Zoe on May 29, 2013 by mara.